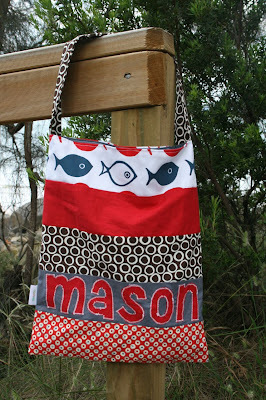 make it perfect: .Christmas Sewing: Play School Library Bags. 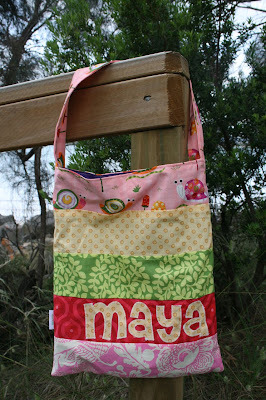 .Christmas Sewing: Play School Library Bags. When I got word that my nephew was attending school using a green enviro supermarket bag as a library bag, I knew what I should make him for Christmas! I'm sure the kids weren't thrilled with their gifts, but their Mum was! They serve a useful purpose at least! I think this will be the next one of your patterns I buy. I think my little girl is about old enough to need an art smock. These are really cute! I am sure Mason and Maya loved them. These bags rock! well done! Nice job! SO great that they have their names on them.